Have you ever forgotten to brush your teeth, realizing only when you have left your house and no longer have an opportunity to do anything about it? Just grab some gum and you will be good until you get home right? 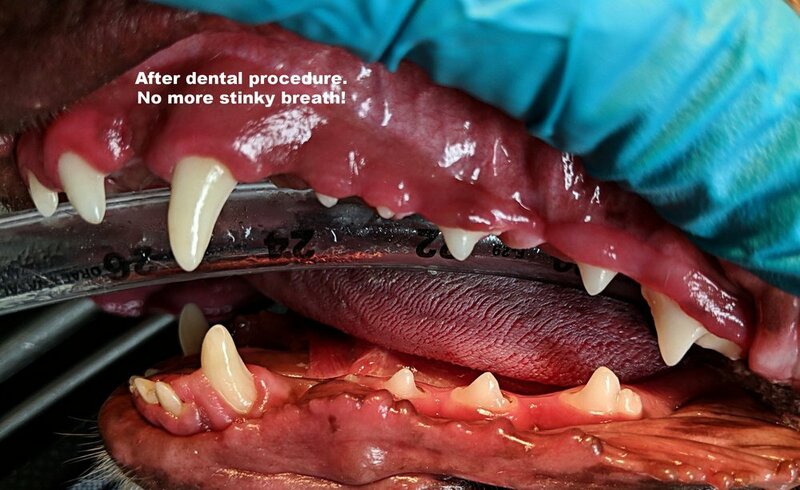 Think about what your pet might be experiencing if it has never had a dental cleaning procedure. Some dogs are blessed with pearly whites well into their geriatric years and do a great job at keeping tartar at bay all on their own, while others can barely make it 6 months without having their breath smell like the litter box! 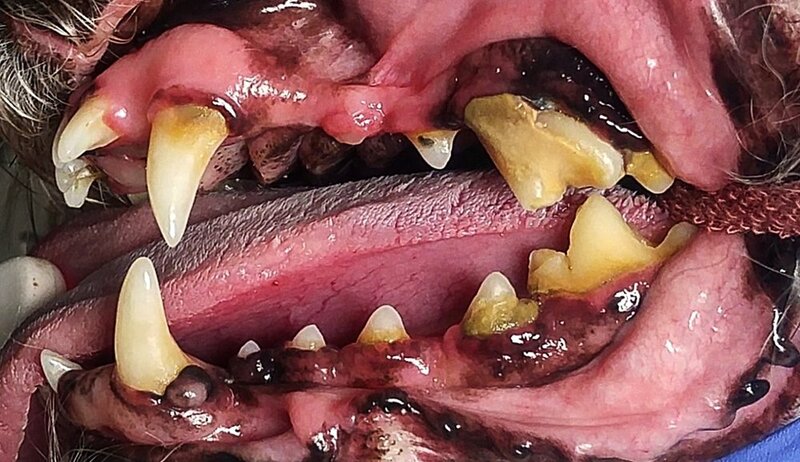 Why is it so important to have my pet’s teeth cleaned regularly? Poor dental hygiene not only leads to stinky breath, it also predisposes your pet to bacterial infections, painful gingivitis, tooth root abscesses and may lead to tooth loss. We want to clean up that mouth for those unexpected kisses, while at the same time making sure your pet’s overall health is maintained. How does my pet get tartar buildup? The combination of saliva, bacteria and food particles lead to a buildup of plaque between teeth and on the tooth surface. As time goes by, the plaque mineralizes and turns into tartar. The tartar gets thicker and leads to gum irritation that is very painful. This tartar accumulation promotes bacterial growth below the gumline that may spread to distant organs like kidneys, heart and liver. Okay, my pet has stinky breath, what are you going to do about it? The first step to dental hygiene is acknowledging there is a problem. Having the teeth inspected during annual physical exams is very important. Mild plaque accumulations can be detected before they become significant tartar. Next your pet's overall health will be evaluated to assess if he or she would be a good anesthetic candidate. Pre-anesthetic blood work and dental x-rays are a good way to screen for underlying disease. If we decide that your pet would benefit from a dental procedure we will then weigh the risks with you and help you make a decision that is best for your pet. Wait, pre-anesthetic, can’t we just brush the tartar off or have a non-anesthetic dental? Not only does a non-anesthetic dental only provide temporary relief for your pet, it is also very dangerous for the patient and provider. Having the patient under general anesthesia protects their airway during flushing and prevents debris from being inhaled, and it allows the technician to perform a deep cleaning and polish the surface. When non-anesthetic dentals are performed, they remove large pieces of tartar and leave behind a nice place for more bacteria and food particles to settle and rebuild. Non-anesthetic dentals are not recommended by the American Veterinary Medical Association or the American Veterinary Dental Society. When can I get my pet in to have an evaluation? We at Rock-N-Country Veterinary Services want to see your pet happy and healthy. In doing so we like to see our patients at least 7 days before their procedure so if they require antibiotics or pre-anesthetic blood work, we can have that finished before procedure.